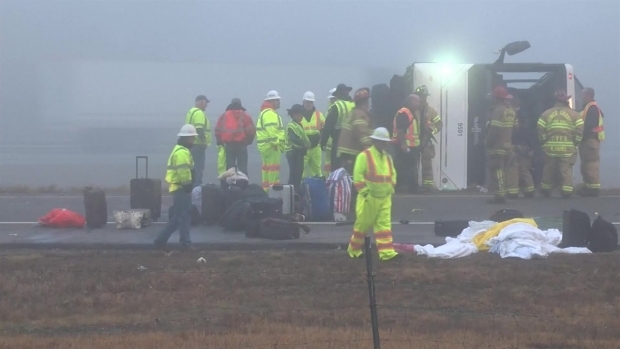 A Staten Island man was arrested and charged with involuntary manslaughter after a charter bus bound for New York flipped on a highway exit ramp in Virginia early Tuesday, leaving two people dead and dozens of passengers, including children, hurt, authorities say. The driver, Yui Man Chow, 40, has been charged with two counts of involuntary manslaughter, Virginia State Police said. He is currently being held on bond at Riverside Regional Jail in Virginia, according to police. His attorney information wasn't immediately available. Fifty-seven people were on the Tao's Travel Inc. bus No. 9591, which was headed to the Manhattan from Orlando, Florida, when the driver tried to take the exit 45 ramp on I-95 in Prince George shortly before 5:30 a.m., according to state police and an employee with the bus company. The bus ended up running off the left side of the ramp and overturned, officials said. An adult male died at the scene; an adult woman died a few hours later at a hospital, state police said. More victims were being treated at area hospitals for injuries ranging from minor to severe, officials said. At least two adults were hospitalized with life-threatening injuries, officials said at a news briefing. There was no immediate information on their identities, but authorities said the youngest hurt was "toddler age." It wasn't known if they were all part of one group. A spokeswoman at a hospital where 12 patients were taken described the worst-injured as being in critical condition. She also said some of the victims were kids, though she didn't say how many children were among the victims. The remaining 43 passengers were being treated at a half-dozen other hospitals; no further details on them were immediately released. The only person not taken to a hospital was the driver, who was not hurt. 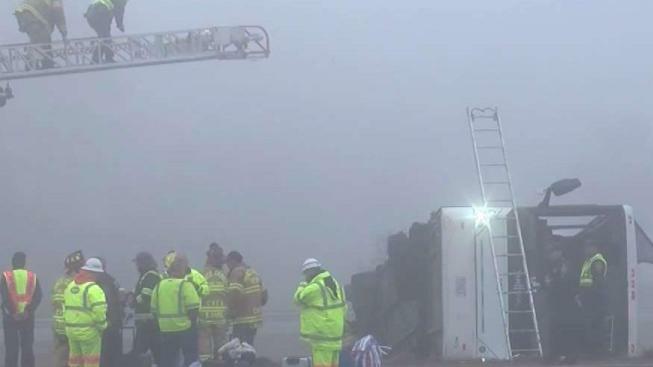 Photos tweeted by the Virginia State Police showed heavy fog ensconcing the emergency scene. Luggage and blankets were seen strewn in the roadway as authorities canvassed the area. Major delays were expected through the day. The bus was seen flipped on its side off to the swampy side of the road as eerie fog shrouded nearby trees and rescue crews in the roadway. Officials said they were looking into whether fog may have played a role. Virginia State Police also said that they were notified that the particular ramp where the incident took place is a "problem area," and were looking at that as a possible factor in the crash as well. No other vehicles were involved in the crash, officials said. The bus route started in Orlando and stopped in Rocky Mountain, North Carolina, before continuing north to its final destination in New York. It was in Rocky Mountain that the bus switched drivers to the one who would later be involved in the crash. An employee with the Massachusetts-based Tao's Travel Inc. confirmed the company's bus was involved in the accident. The man said the bus was chartered by a Chinatown-based company that sells tickets to customers and hires a bus to take them to and from their destinations. A person who answered the phone at a number listed for the Chinatown company had no information on the crash and asked that questions be emailed. A News 4 email seeking comment was not immediately returned Tuesday morning. Tao's Travel Inc. has a satisfactory federal safety rating and had not been involved in any crashes that caused injury or required a tow in the 24 months prior to Tuesday's accident, according to online records. The investigation is ongoing. A representative with the Federal Motor Carrier Safety Administration was on scene. The National Transportation Safety Board says it will not be sending a team to the crash site at this time. Family of anyone who may have been on the bus can call the Prince George Emergency Services Center at 804-733-2659 for info. A Family Reunification Center has been set up at the Prince George County Central Wellness Center where translators will be on hand. Red Cross Virginia is also assisting.